In this factsheet we provide an overview of key trends in official development assistance (ODA) emerging from the April 2017 Organisation for Economic Co-operation and Development (OECD) Development Assistance Committee (DAC) data release. ODA levels fell slightly in 2017 compared with 2016, the first year-on-year fall in net ODA since 2011–2012 due to an 11% reduction in reported spending on refugees within OECD DAC member countries. Without a reduction in reported refugee spending, ODA would have risen slightly. 18 out of 29 DAC member states reduced ODA spending in 2017. Five donors met the 0.7% ODA/GNI target in 2017, down from six in 2016. Five donors gave at least 0.15% of GNI in ODA to LDCs in 2017, down from six in 2016. If the new rules on accounting for ODA loans (due to come into force for data published in 2019) were applied to 2017 ODA, then the value of ODA from DAC donors would have appeared to be US$3.6 billion higher than under the existing rules. 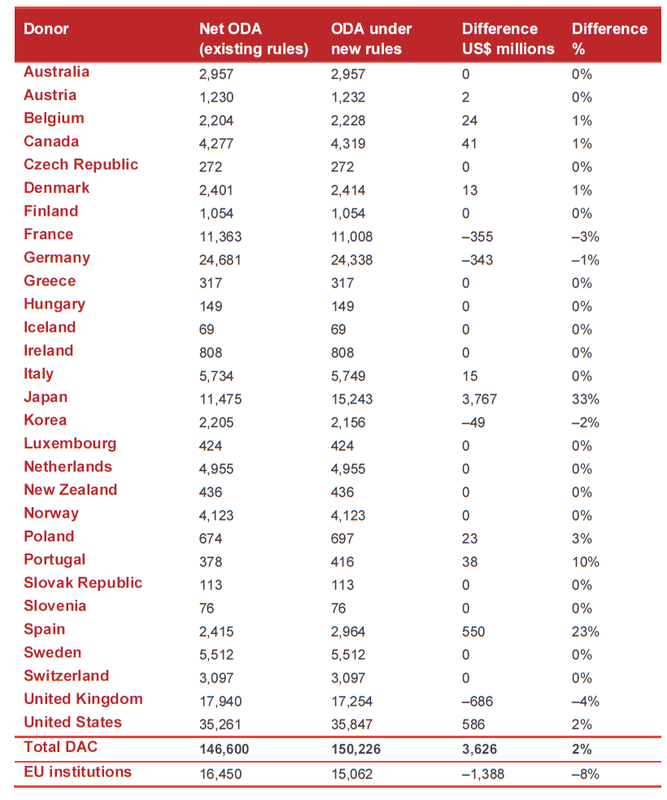 Under the new rules, ODA from Japan would be one-third higher than under the existing rules and the UK would not have reached the 0.7% target if the new rules had been in force. Total net ODA from DAC donors declined by US$800 million, or 0.6% between 2016 and 2017. This is the first fall in the headline ODA measure since 2012. This fall was due to a reduction in the costs of supporting refugees in donor countries reported as ODA. Excluding in-donor refugee costs, net ODA rose by US$989 million (0.8%). In-donor refugee costs reported as ODA fell by US$1.8 billion or 11% in 2017 after rising rapidly since 2014. There were large falls in in-donor refugee costs reported as ODA by Germany (US$708 million), Norway (US$657 million), Austria (US$448 million), Switzerland (US$408 million) and Denmark (US$341 million). These falls were partially offset by increases in the amount of in-donor refugee costs reported as ODA by other donors, notably Netherlands (US$379 million) and Spain (US$124 million). 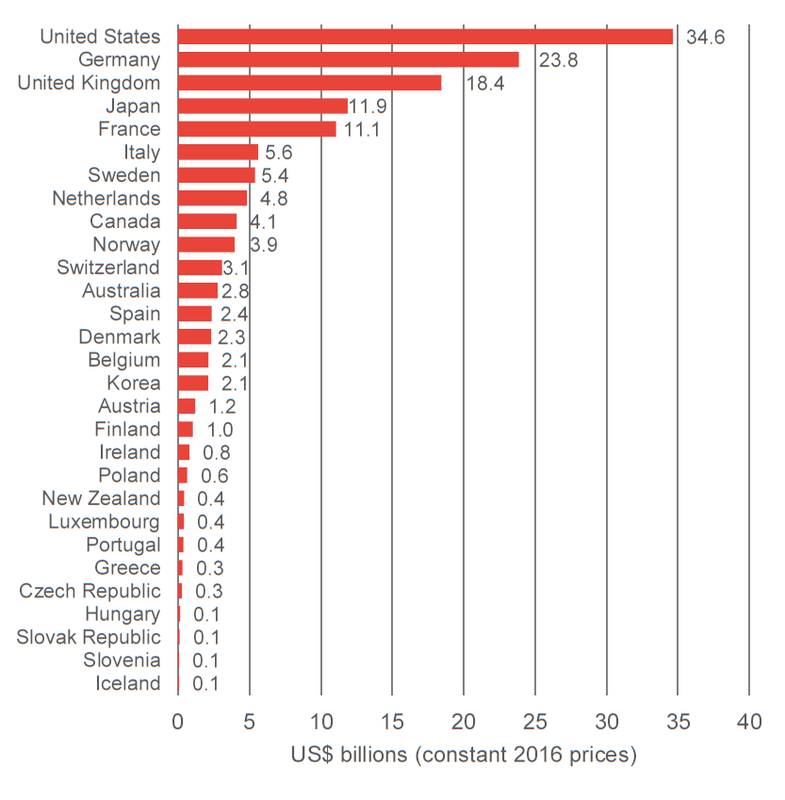 The US remains the largest single donor of ODA followed by Germany, the UK, Japan and France – the order of the largest five donors remains unchanged from 2017. These five largest donors accounted for almost 70% of all net ODA disbursed in 2017. Italy, the eighth largest donor in 2016, was the sixth largest in 2017. Conversely, the Netherlands was the sixth largest donor in 2016, but fell to eighth in 2017. The largest reduction in ODA was made by Spain, with net disbursements falling by US$1.9 billion (45%). This was due to Spain’s 2016 ODA being boosted by over US$2 billion due to a one-off debt relief/reorganisation deal between Spain and Cuba. ODA from France rose as a result of a large increase in bilateral ODA loans together with a rise in core multilateral contributions – mainly to UN agencies. 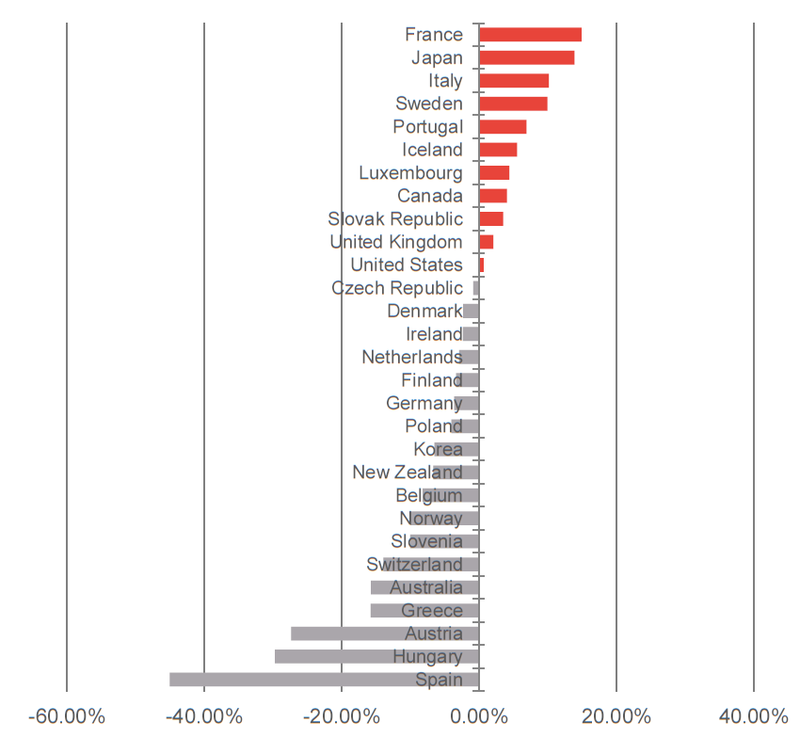 The rise in Japan’s ODA was also driven by an increase in bilateral ODA loans. Five DAC members disbursed at least 0.7% of GNI in the form of ODA in 2017. 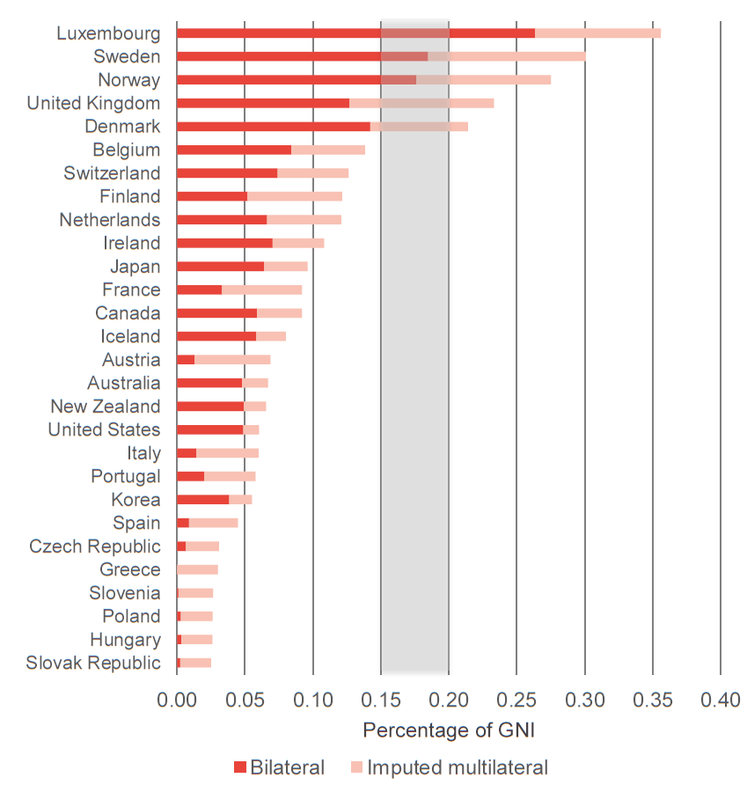 Three donors – Sweden, Luxembourg and Norway disbursed roughly 1% of GNI as ODA. 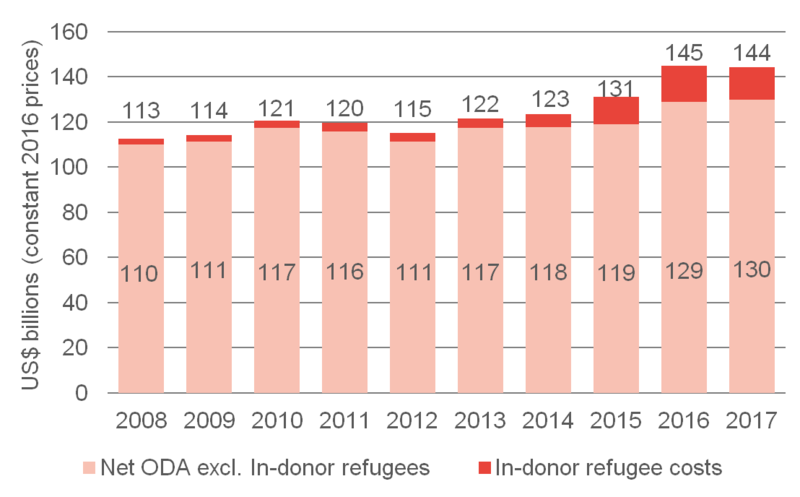 Germany’s ODA fell from 0.7% of GNI in 2016 to 0.66% in 2017, due to the large reduction in in-donor refugee costs reported as ODA by Germany. Germany failed to report how much ODA was directed to LDCs in 2017. ODA to LDCs from the other 28 DAC member states rose slightly in 2017. 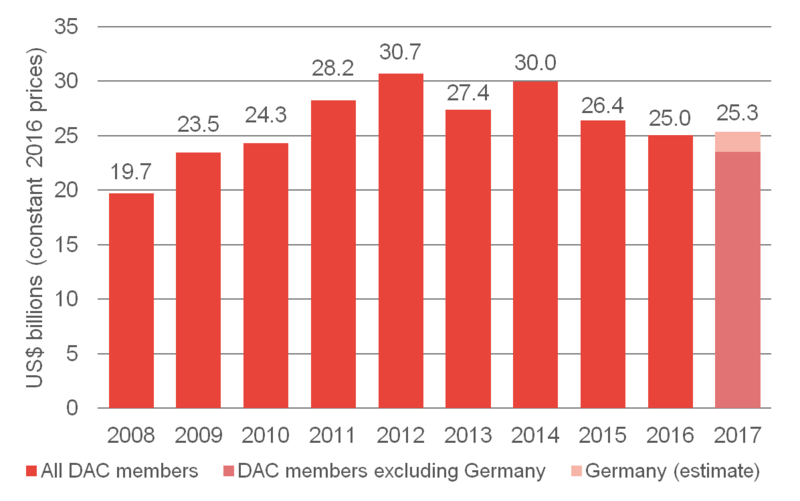 Figure 6 assumes that Germany’s ODA to LDCs is equal to the average figure for 2011–2016. It appears highly likely that net ODA to LDCs was over US$5 billion lower in 2017 than in 2012. The 2011 Istanbul Programme of Action for LDCs recommended donors spend 0.15%–0.20% of GNI on LDCs. This target is represented by the shaded area in Figure 7. 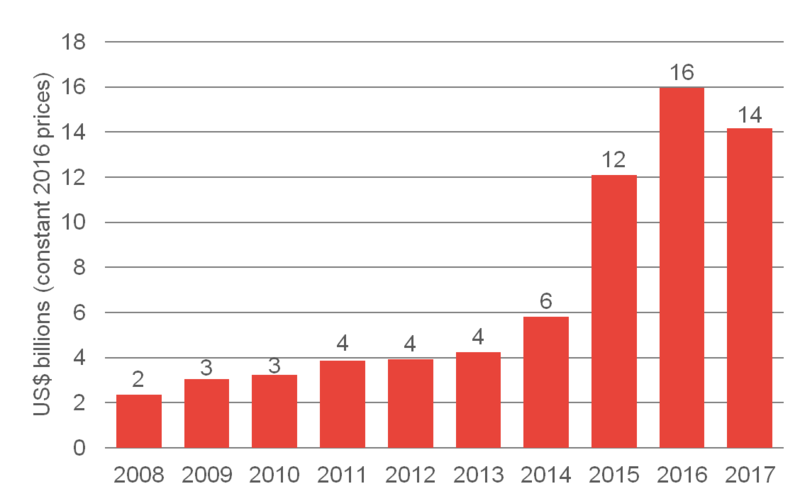 Five donors met this target in 2017, down from six in 2015. Imputed multilateral estimates are derived from 2017 donor disbursements by multilateral organisations applied to the share of multilateral expenditure on LDCs in 2016. The rules around donors’ reporting of ODA loans are changing. For data on 2018 ODA (to be published in 2019), onwards only the grant element of ODA loans will be counted as ODA, rather than the full face value. This reduction in the amount of ODA counted for each loan will be offset by the fact that capital repayments on loans will no longer be subtracted from the headline ODA measure. These new rules will have different effects on different donors. In short, donors who give loans on the most concessional terms will see the smallest reduction in the value of loans counted as ODA and those donors who receive the highest level of repayments will see the greatest rise in headline ODA because the repayments will no longer be deducted. In aggregate, ODA from DAC member states would have appeared to be US$3.6 billion, or 2%, higher in 2017 under the new rules than under the existing net ODA measure. This apparent increase is solely due to the change in accounting for ODA loans, not any effort on the part of donors. Japan, which receives by far the largest share of loan repayments among DAC members, would see its reported ODA levels rise by a third due to these repayments not being subtracted from ODA. The US, despite no longer giving any ODA in the form of loans, would see an apparent increase in ODA levels as it receives around US$0.6 billion in repayments on old ODA loans each year. Again these repayments would not be deducted from the headline ODA figure under the new rules. 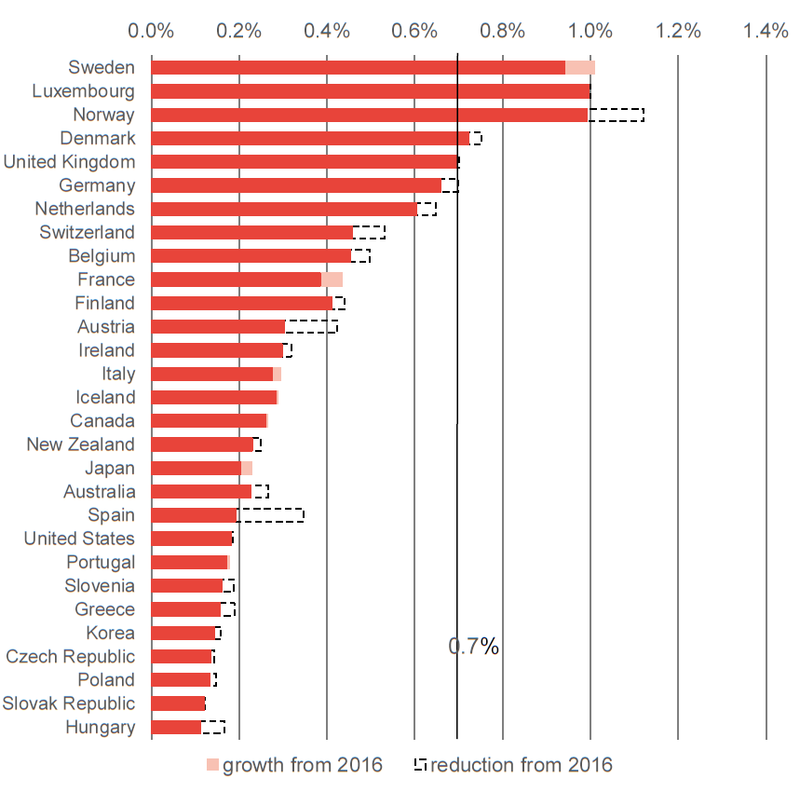 The UK would not have achieved the 0.7% ODA/GNI target in 2017 under the new rules because only a proportion of its loans made in 2017 would have counted as ODA, rather than the full face value. Reported ODA disbursed by the EU would have appeared to be US$1.4 billion, or 8%, lower under the new rules. France and Germany would have seen apparent falls in their reported ODA, of US$355 million and US$343 million respectively, if the new rules had applied in 2017. See OECD, 2015, Why modernise official development assistance? Available at: www.oecd.org/dac/financing-sustainable-development/Addis%20flyer%20-%20ODA.pdf. Grant element is the standard way of measuring how concessional a loan is. It can be viewed as the difference between the cost, in today’s prices, of the future repayments a borrower will have to make on the loan in question and the repayments the borrower would have had to make on a non-concessional loan. This is therefore the amount of money that is considered to have been ‘given away’ by the donor, hence ‘grant element’. The grant element is normally shown as a percentage of the value of the loan. Low interest rates and longer maturity periods will result in higher grant element percentages. 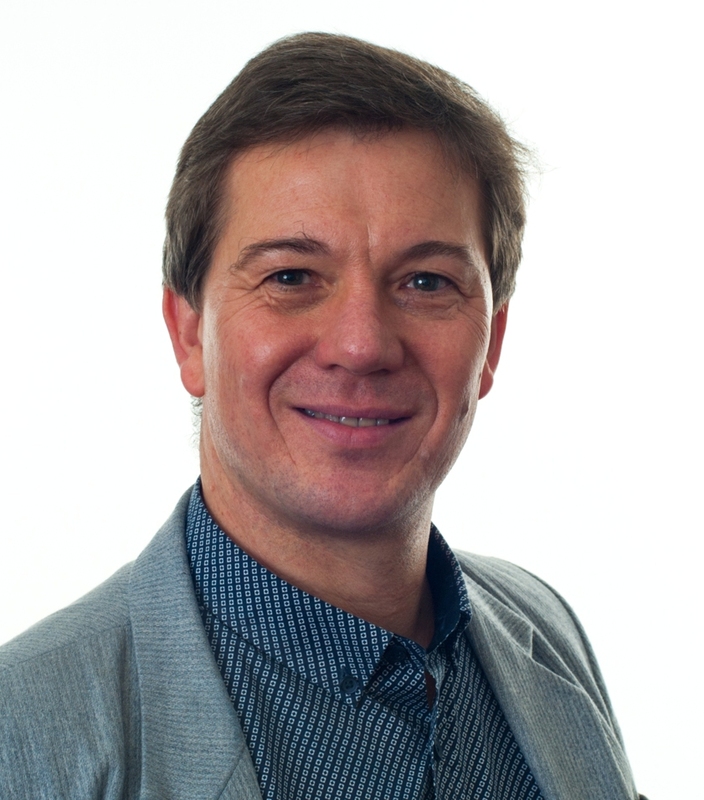 Any loan with a ‘grace period’ – that is a period of time before any repayments have to be made – will also have an increased grant element.